You can navigate, call up information, and enjoy entertainment in real time in your Porsche. After 12 months of free trial period. When you are immersed in the joy of driving your Porsche, the Navigation & Infotainment services will keep you informed of what's happening in the world in real time – whether it is with the latest news or the traffic situation on a weekend away with the whole family. You can use the Online Search function in the navigation system or through Voice Control to find addresses and points of interest conveniently. Voice control in your new Cayenne will allow you to fully focus on what is important, which is the road, while driving. During navigation, your route guidance automatically adapts to traffic situations provided by real-time traffic information and finds the quickest way to the destination for you. The satellite maps will further enhance your expericence viewing the route by providing realistic and detailed road images along the way. 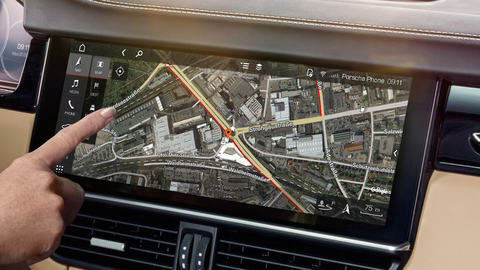 No worries about your maps becoming outdated, your in-car internet connection will automatically provide you new map update notifications and you can choose the update at your leisure - saving you time from a visit to the dealership. There are other useful services to keep you informed while on the road. For example, News Feeds will let you know what is going on around the world. Also, Message Dication will read all messages out loud to you and help, through the Voice Control feature, construct a response without taking your hands off the wheel. When your Porsche is in need of gasoline, the Gas Station location service will automatically find a station nearest to you and guide you to it. "The Cyber Monday offer is only available for customers whose free trial has ended in the past and did not renew/purchase the Navigation & Infotainment Package again and for customers whose free trial will end during this campaign or 90 days after the offer. This is a one-time offer only valid on November 26th, 2018."